If you are shopping for a midsize sedan to get you around town, stop by our lot and let us show you the Ford Fusion. If technology is important to you, you will love this popular Ford car. Wouldn't it be nice to have access to a number of different radio stations while on the road? To be able to listen to talk shows and all of your favorite music? 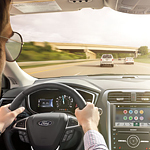 The Ford Fusion gives you the chance to get set up with a Sirius XM connection if that is something that you feel you would use often on the road. There is a special system available for the Ford Fusion that makes it easy for you to access content from your phone. This system allows you to use all that is on your phone right from the screen of your car, and it allows you to play music from your phone through your car's speakers.